An interesting little issue cropped up last week when using a PG Scale rubric in Turnitin. 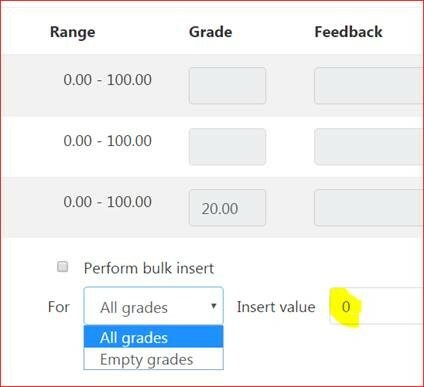 Normally we look at the Maximum Grade & Marks available in the assignment change to 16 and this will reflect the scale if the scale has been attached to the assignment using Grade Type. Now this needed to be unlocked and the Maximum grade changed to 16. As you may know Turnitin updates Moodle but Moodle doesn’t update Turnitin so I concentrated on what happens in Moodle knowing that the grading carried out in Turnitin would be unaffected. So in the Grader Report I switched to the Single View for the assignment. 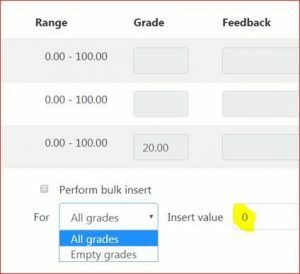 Once the bulk insert was complete I was able to return to the assignment settings and adjust the maximum grade to 16 by first switching Grade Type to Point – setting Maximum Grade to 16 and then switching Grade Type to Scale and check that the Maximum marks in the assignment was also set to 16. When using the PG Scale I also switch the Grade Display to fraction or I and students would see a nonsensical percentage value. And that should be ready to go. One Response to "Grade types: changing after you’ve started marking Turnitin assignments"
To the next! Kind regards!